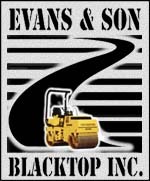 Evans & Son Blacktop, Inc. Established in 1972 and have been committed to satisfying customer needs for over 40 years. We use only the most advanced paving techniques and have earned the reputation in the community as the Premiere Asphalt Paving Contractor for the area. The key to our success is our diversity. We are skilled in all types of asphalt paving; whether it be Driveways, Parking Lots, Running Tracks, Tennis & Basketball Courts, or Multi-Purpose Omni-Courts. Each year we acquire thousands of new customers. We would like the opportunity to serve your needs. Please Contact Us to speak with one of our experienced, knowledgeable estimators about your upcoming paving projects. We know the importance of having a job completed on time and before the deadline or closing date. If you are looking for a reliable paving contractor, please give us an opportunity to show what we can do for you. We will gladly provide a list of references, and/or arrange for you to view some of the projects we have completed and or are are currently working near your area. The size of the project determines the distance we will travel. In the past, we have built tennis courts as far north as Lake Geneva, Wisconsin and as far south as Kankakee, Illinois.